For the elderly, Samsung has developed a series of simpler mobile phones with larger buttons, easy-to-read text, comfortable shapes and better sound quality. Designed by wireless industry veteran Martin Cooper and GreatCall's Arlene Harris, the Samsung-based Jitterbug mobile phones come with personalized services including an easy way to retrieve messages, a live operator for call-related support, and toll-free secure access to a personal contact list from any phone. "Boomers want to help their parents enjoy all the benefits that technology can contribute to bringing families closer together, without putting them through the angst of learning high tech devices they don't feel comfortable with," said Tim Bajarin, president of Creative Strategies. "Boomers also are seeking innovative ways to provide well-being support remotely. Jitterbug helps fulfill both objectives with its natural, intuitive interface of both handset and service." 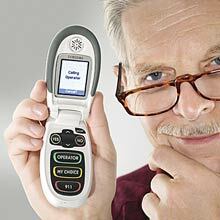 Jitterbug cell phone and services options include basic, premium and unlimited calling plans. Jitterbug Plus, one of the newer Jitterbug phone models, has a camera and comes in red and silver. The latest in the Jitterbug series is the Jitterbug Touch 2 smartphone with a 5.0 megapixel camera and video recording capability.